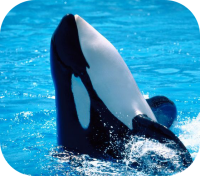 The term whale sometimes refers to all cetaceans. Cetaceans are divided into two sub-orders: Mysticeti and Odontoceti. Mysticeti whales are also called Baleen whales. The Baleen whales have plates of baleen suspended from their upper jaw. The baleen is made of keratin and filters plankton from the water. The Odontoceti, refers to the group of Toothed whales. Toothed whales are carnivores and eat fish, sea lions and some types of other whales. Like all mammals, whales are warm-blooded, breathe air, and feed their young milk. Size: The smallest whale is thought to be Hector's dolphin. Hector's dolphin is 3.25 - 5.25 feet in length, and they weigh between 88 and 132 lbs. The largest whale is the blue whale, which grows to be about 94 feet and weights 180 metric tons. Habitat: Whales live in all of the world's oceans. The range and location of whales vary by species. Diet: Whales have a varied diet from microscopic plankton to large marine mammals. Baleen whales eat krill and plankton, while Toothed whales eat fish, seals and some other whales. 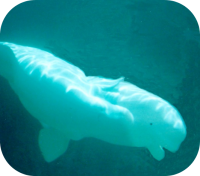 Communication: Whales have an elaborate communication system, they make sounds, that are likened to songs. These sounds are extremely loud depending on the species and can be heard for many miles. Whales are the hippopotamus's closest living relatives. Gestation: Depending on the species whales will carry their young for 9-15 months. Birth: Whales typically give birth to a single calf at a time. Life Span: Whales will generally live an average 20-40 years, but they can live up to 80 years, depending on the species. Social Structure: Baleen whales, tend to migrate long distances from their cold-water feeding grounds to warm-water breeding grounds each year. Baleen whales are typically solitary, but may migrate in groups, on their annual migrations. Toothed whales on the other hand, congregate in pods, and will often hunt in groups, migrate as a unit, and share the duties of rearing the young. The strongest social ties in whale families are between mother and calf. 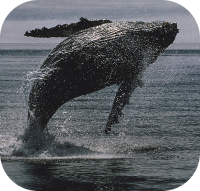 Athleticism: Whales are active in the water, they will jump high, and breach. 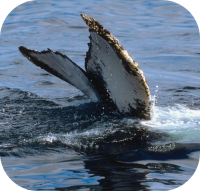 Whales will also thrust their tails out of the water and slap the water's surface.